Celebrated and revered around the world as one of the greatest musical artists to ever grace the stage, Bob Marley has given the world some of the most-loved songs, including “No Woman, No Cry,” “I Shot The Sherriff” and “Could You Be Loved,” among countless others. Rising from the humble origins of Trenchtown in Kingston, Jamaica, Bob Marley rose to the very pinnacle of music royalty with his status as icon and legend only growing each year since his passing. But how did this skinny kid from the ghetto slum of Trenchtown rise to the highest heights of pop music? By all accounts, Bob Marley’s success was as impressive as it was improbable. Coming from a country not previously known for its musical exports, as well performing a new musical genre unfamiliar to most of the world, Bob Marley invaded the public consciousness with a new sound that was ultimately embraced by people as far away as Canada, Germany and Japan. As the title promises, in this new self help book, personal success author Hervict Jacobs looks at the success secrets of Bob Marley, and traces how he went from the slums of Kingston to becoming the legend that he is today by examining the insights that helped him rise from nothing having a personal net worth of $30 million at the end of his life. This book is for creative artists of all kinds: writers, musicians, filmmakers, and screenwriters as well entrepreneurs and small business owners. 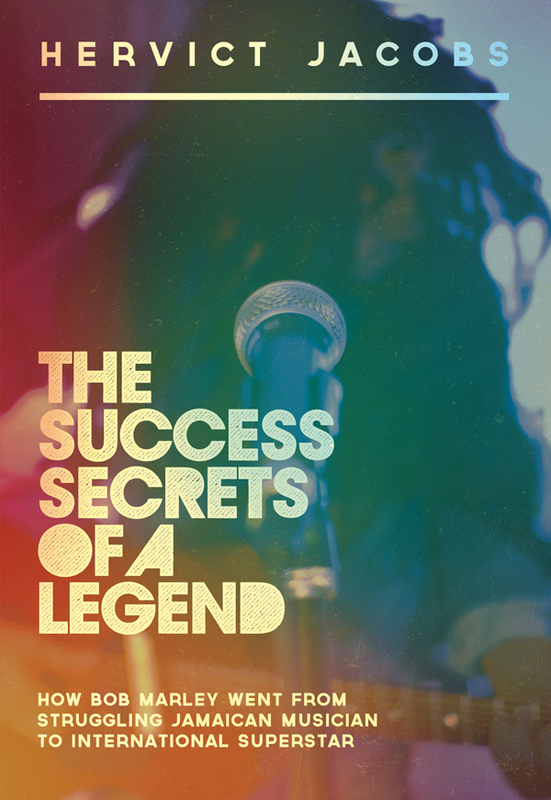 Whatever your creative passion, THE SUCCESS SECRETS OF A LEGEND will show you the techniques and strategies that Bob Marley used to achieve his dream of musical success, and how you can use these same insights to take your career and business to the next level. Some of the topics covered include, starting where you are no matter how bleak the circumstances may seem, the importance of brand to success and how Bob Marley built his brand through years of small gigs. It will also examine how Bob Marley got a London-based record label to partner with him and how you can get investors to partner with you. What makes the story of Bob Marley’s success so uniquely compelling is the very lows of abject poverty from which he rose. Moving from rural St. Anne with his mother to Trenchtown, with no advantage or promise of future success, Bob Marley steadfastly worked his way up from nothing. Bob Marley’s life story, while it is a fascinating rags to riches story, is more than just the gripping saga of a boy with a dream who overcame the odds, it’s a blueprint for anyone who longs to follow their dreams. Neither this book, the author nor the publisher is affiliated with or endorsed by the estate of Bob Marley or the Marley family. You can purchase the book online from Smashwords in multiple eBook formats at https://www.smashwords.com/books/view/435456.